They say there are only two things in life you can count on: death and taxes. Welp, according to these videos you can also place your trust in the Beef and Dairy industries! (Thank you, farmers!) Merck Animal Health sponsored the videos. Of course, I have to include a plug! Osborn & Barr, where I interned this summer, created these videos! Everyone there is super talented and these videos are only a glimpse into their knowledge and skills. I am currently a sophomore at Butler Community College where I am a member of the famed Livestock Judging Team! I am a born and raised Missouri gal with a passion for livestock. I took a chance and moved to the small town of El Dorado, Kansas where I hoped to further my love of agriculture. And I’m happy I did. Back in Missouri I along with my parents, Ernie and Tammy, and my brother Sam manage around 150 head of cows. Angus cattle have always been our passion but recently we’ve been showing a few Simmental and crossbreds. Oh and of course a few pigs! It’s really been a fun new experience for us. Unlike many families, my parents actually both work full time on the farm. Our cattle are a big part of my family’s income so we spend a lot of time exhibiting them across the country. Here at Butler my weeks consists of giving multiple sets of reasons, traveling across the country for workouts, and when I’m not judging, I love spending time with my teammates! We’re kind of a big family around here. Oh and did I mention I film a tv show every week? One of the newest additions to my life is my job as a co-host of The Angus Report. That’s right every other week I make the long trip to St. Joseph, Missouri where we film a weekly television show for the American Angus Association. The show airs every Monday morning at 7:30 and Saturday afternoons at 1:30 on RFDtv! Or you can find past episodes by searching “The Angus Report” on Youtube. So what else defines Paige Wallace? Well if you haven’t already noticed the title of this blog tells you about a very large part of my life. If you spent a day in my shoes you might hear the title “royalty” or “queenie” quite often. This is because for the past year I have served as Miss American Angus. It has been my duty to travel the country attending national shows and banquets, and you can’t forget all those backdrop pictures I get to take! I can’t even begin to explain how much of a life changing experience it has been, one that will unfortunately come to an end next week. I even got to work a show with my dad! So as you can see I’ve been blessed with the opportunity to do some pretty cool things in my life. Coming to Butler and being a member of this team has opened so many doors for me and I thank God every day that he lead me to a place like this. It was that time of the year, the end of October. 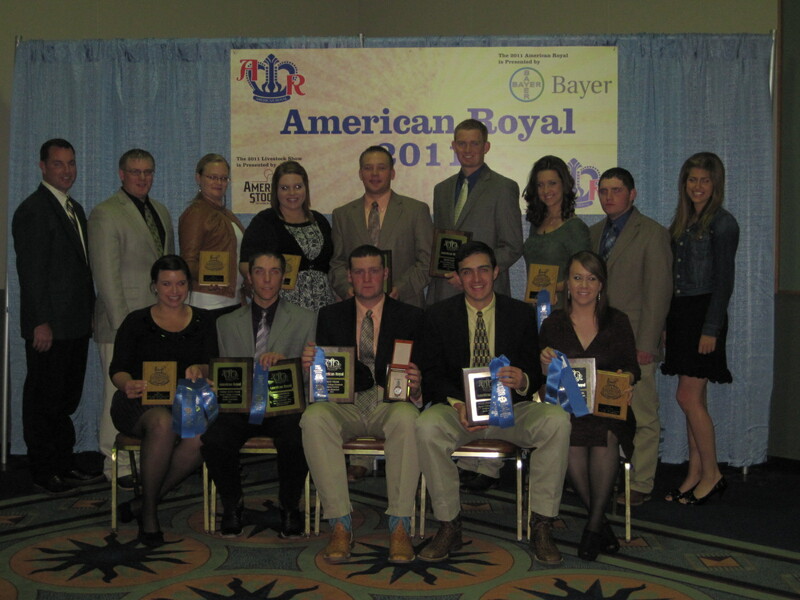 Livestock judgers from across the country had migrated to Kansas City to compete in the American Royal; as always, Butler was a part of the group! After many months of preparation we were ready to conquer our nerves and compete in our first national contest. We began our experience at the Royal by attending the Agricultural Communicators of Tomorrow, Speed Meet Workshop held Thursday evening. Industry experts from across the country gathered to share their experiences and answer any questions we had. Other attendees included Oklahoma State, Kansas State, Arkansas, and Missouri. This was the second annual opportunity for students to meet with professionals, and the evening was easily a success. Thank you to all of the volunteers who participated in and put on the event! And now for the main event! After was all said and done, the results were as follows. Butler CC: 3rd Overall Team, Team Members: Maverick Squires, Taylor Graham, Alyson Moore, Kinzie Selke, and Jared Wynn. Maverick Squires, 1st Overall Individual. 1st in Cattle and Reasons, 3rd in Swine and Sheep and Goats. Congratulations to all who competed, we look forward to our next contest, NAILE in Louisville! See you there in just a couple weeks! You are currently browsing the Butler Agvocates weblog archives for November 2011.